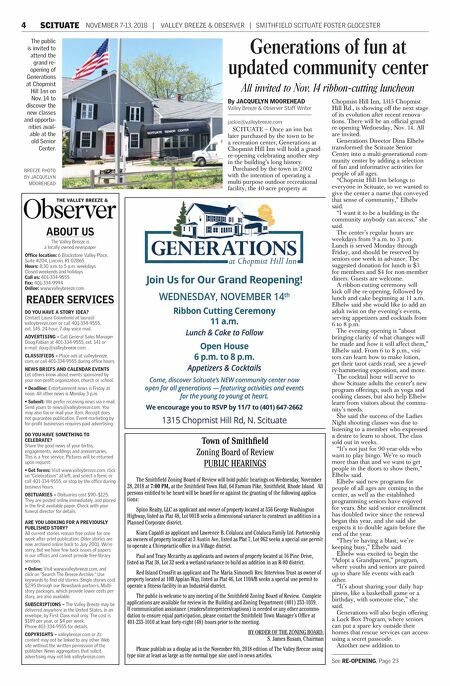 4 SCITUATE NOVEMBER 7-13, 2018 | VALLEY BREEZE & OBSERVER | SMITHFIELD SCITUATE FOSTER GLOCESTER BREEZE PHOTO BY JACQUELYN MOOREHEAD The public is invited to attend the grand re- opening of Generations at Chopmist Hill Inn on Nov. 14 to discover the new classes and opportu- nities avail- able at the old Senior Center. Generations of fun at updated community center All invited to Nov. 14 ribbon-cutting luncheon SCITUATE – Once an inn but later purchased by the town to be a recreation center, Generations at Chopmist Hill Inn will hold a grand re-opening celebrating another step in the building's long history. Purchased by the town in 2002 with the intention of operating a multi-purpose outdoor recreational facility, the 40-acre property at Chopmist Hill Inn, 1315 Chopmist Hill Rd., is showing off the next stage of its evolution after recent renova- tions. There will be an official grand re-opening Wednesday, Nov. 14. All are invited. Generations Director Dina Elhelw transformed the Scituate Senior Center into a multi-generational com- munity center by adding a selection of fun and informative activities for people of all ages. "Chopmist Hill Inn belongs to everyone in Scituate, so we wanted to give the center a name that conveyed that sense of community," Elhelw said. "I want it to be a building in the community anybody can access," she said. The center's regular hours are weekdays from 9 a.m. to 3 p.m. Lunch is served Monday through Friday, and should be reserved by seniors one week in advance. The suggested donation for lunch is $3 for members and $4 for non-member diners. Guests are welcome. A ribbon-cutting ceremony will kick off the re-opening, followed by lunch and cake beginning at 11 a.m. Elhelw said she would like to add an adult twist on the evening's events, serving appetizers and cocktails from 6 to 8 p.m. The evening opening is "about bringing clarity of what changes will be made and how it will affect them," Elhelw said. From 6 to 8 p.m., visi- tors can learn how to make lotion, get their tarot cards read, see a jewel- ry-hammering exposition, and more. The cocktail hour will serve to show Scituate adults the center's new program offerings, such as yoga and cooking classes, but also help Elhelw learn from visitors about the commu- nity's needs. She said the success of the Ladies Night shooting classes was due to listening to a member who expressed a desire to learn to shoot. The class sold out in weeks. "It's not just for 90-year-olds who want to play bingo. We're so much more than that and we want to get people in the doors to show them," Elhelw said. Elhelw said new programs for people of all ages are coming to the center, as well as the established programming seniors have enjoyed for years. She said senior enrollment has doubled twice since the renewal began this year, and she said she expects it to double again before the end of the year. "They're having a blast; we're keeping busy," Elhelw said. Elhelw was excited to begin the "Adopt a Grandparent," program, where youths and seniors are paired up to share life events with each other. "It's about sharing your daily hap- piness, like a basketball game or a birthday, with someone else," she said. Generations will also begin offering a Lock Box Program, where seniors can put a spare key outside their homes that rescue services can access using a secret passcode. Another new addition to By JACQUELYN MOOREHEAD Valley Breeze & Observer Staff Writer jackie@valleybreeze.com See RE-OPENING, Page 23 ABOUT US The Valley Breeze is a locally owned newspaper Office location: 6 Blackstone Valley Place, Suite #204, Lincoln, RI 02865 Hours: 8:30 a.m. to 5 p.m. weekdays. Closed weekends and holidays. Call us: 401-334-9555 Fax: 401-334-9994 Online: www.valleybreeze.com READER SERVICES DO YOU HAVE A STORY IDEA? Contact Laura Colantonio at laura@ valleybreeze.com or call 401-334-9555, ext. 145. 24-hour, 7-day voice mail. ADVERTISING – Call General Sales Manager Doug Fabian at 401-334-9555, ext. 141 or e-mail: doug@valleybreeze.com. . CLASSIFIEDS – Place ads at valleybreeze. com, or call 401-334-9555 during office hours. NEWS BRIEFS AND CALENDAR EVENTS Let others know about events sponsored by your non-profit organization, church or school. • Deadline: Entertainment news is Friday at noon. All other news is Monday 3 p.m. • Submit: We prefer receiving news via e-mail. Send yours to news@valleybreeze.com. You may also fax or mail your item. Receipt does not guarantee publication. Event marketing by for-profit businesses requires paid advertising. DO YOU HAVE SOMETHING TO CELEBRATE? Share the good news of your births, engagements, weddings and anniversaries. This is a free service. Pictures will be returned upon request. • Get forms: Visit www.valleybreeze.com, click on "Celebrations" at left, and select a form; or call 401-334-9555; or stop by the office during business hours. OBITUARIES – Obituaries cost $90–$125. They are posted online immediately, and placed in the first available paper. Check with your funeral director for details. ARE YOU LOOKING FOR A PREVIOUSLY PUBLISHED STORY? All current stories remain free online for one week after print publication. Older stories are now archived online back to July 2001. We're sorry, but we have few back issues of papers in our offices and cannot provide free library services. • Online: Visit www.valleybreeze.com, and click on "Search The Breeze Archive." Use keywords to find old stories. Single stories cost $2.95 through our Newsbank partners. Multi- story packages, which provide lower costs per story, are also available. SUBSCRIPTIONS – The Valley Breeze may be delivered anywhere in the United States, in an envelope, by First Class mail only. The cost is $189 per year, or $4 per week. Phone 401-334-9555 for details. COPYRIGHTS – valleybreeze.com or its content may not be linked to any other Web site without the written permission of the publisher. News aggregators that solicit advertising may not link valleybreeze.com. 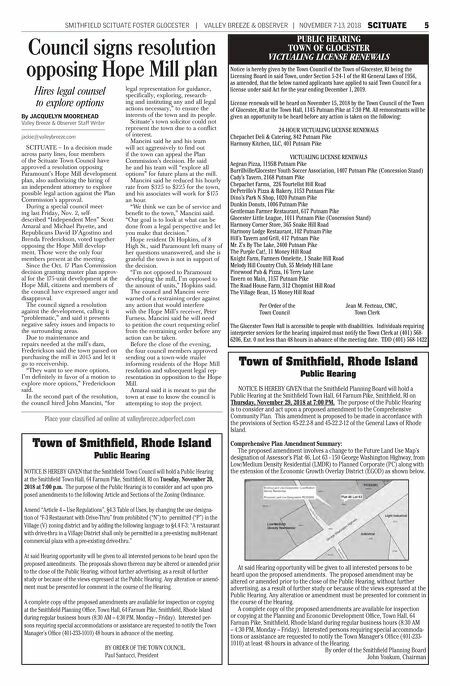 Town of Smithfield Zoning Board of Review PUBLIC HEARINGS The Smithfield Zoning Board of Review will hold public hearings on Wednesday, November 28, 2018 at 7:00 PM, at the Smithfield Town Hall, 64 Farnum Pike, Smithfield, Rhode Island. All persons entitled to be heard will be heard for or against the granting of the following applica- tions: Spino Realty, LLC as applicant and owner of property located at 356 George Washington Highway, listed as Plat 48, Lot 001B seeks a dimensional variance to construct an addition in a Planned Corporate district. Kiara Capaldi as applicant and Lawrence B. Colaluca and Colaluca Family Ltd. Partnership as owners of property located at 3 Austin Ave, listed as Plat 7, Lot 062 seeks a special use permit to operate a Chiropractic office in a Village district. Paul and Tracy Mccarthy as applicants and owners of property located at 16 Pine Drive, listed as Plat 38, Lot 32 seek a wetland variance to build an addition in an R-80 district. Red Island CrossFit as applicant and The Maria Simonelli Rev. Intervivos Trust as owner of property located at 10B Appian Way, listed as Plat 46, Lot 110A/B seeks a special use permit to operate a fitness facility in an Industrial district. The public is welcome to any meeting of the Smithfield Zoning Board of Review. Complete applications are available for review in the Building and Zoning Department (401) 233-1039. If communication assistance (readers/interpreters/captions) is needed or any other accommo- dation to ensure equal participation, please contact the Smithfield Town Manager's Office at 401-233-1010 at least forty-eight (48) hours prior to the meeting. BY ORDER OF THE ZONING BOARD. S. James Busam, Chairman Please publish as a display ad in the November 8th, 2018 edition of The Valley Breeze using type size at least as large as the normal type size used in news articles.